The next evening, Sri Swamiji was quite restless. He sat beside Sri Premika Varadan first, then walked a bit, then looked like he was in deep conversation with Sri Premika Varadan. Then Sri Swamiji said out aloud, “I have planned Vasantotsavam for Permika Varadan here but he wants to go to Thirunaangoor”. Thus our Premika Varadan was all set to travel to Thirunaangoor. One of the devotees in Ashram asked Sri Swamiji if he should be considering a place which is cool in summer because Thirunaangoor will be quite hot. Sri Swamiji replied without hesitating that Sri Premika Varadan will cool down any place he visits. On being asked the return date, Sri Swamiji said that the visit to Thirunaangoor itself was Sri Premika Varadan’s wish and hence returning date will also be in accordance to his wish. Thirunaangoor, located near Sirkazhi has nearly 11 dhivya desams. Many of these are rendering services to the lord under Sri Swamiji’s guidance. Apart from this, puja is also taking place every day in these sthalams. All the materials needed for the puja in these sthalams is taken care by Sri Chaitanya Prabhu Nama Bhiksha Kendra. This is where Sri Jayanthi Janakiraman memorial Vaishanava Agama Padashala is being run. Vaishava Aagamam, four thousand Dhivya Prabhandhams and the Vedas are being taught here. 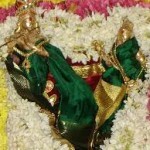 When Sri Premika Varadan plans something, there is a reason behind it. So this trip did not go without a reason. 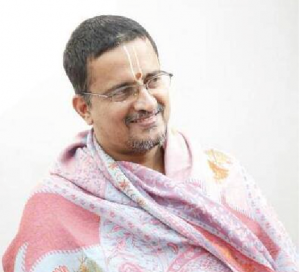 Sri Ramkumar is the person who has been managing the naangur Vaishanva Padashala. Just a day before, he had cried that he could not see Premika Varadan and render services to him. So one of the reasons for Sri Premika Varadan’s visit was also to bless Sri Ramkumar with his darshan. Just as Sri Swamiji mentioned, the moment Sri Premika Vardhan and Sri Madhuri Sakhi stepped into Sirkazhi, there was a heavy downpour. There was heavy rain in Naangur on 4th night and 5th morning. Sri Premika Varadan stayed there only for those 2 days. Thus ended Sri Premika Vardhan’s summer vacation in Naangur. The Vasantotsavam that began in Naangur the first 2 days finally ended in Madhurapuri Ashram.